Lynn Ann (Manley) Giard, 67, beloved wife to Raymond P. Giard of Ellington, passed from this life suddenly on Friday, August 3, 2007 surrounded by her loving family. Born in Hartford, daughter of the late Herbert and Rose (Sullivan) Manley, she lived in Vernon before moving to Ellington 29 years ago. Lynn was a communicant of St. Luke Church, Ellington. She was a loving and devoted wife, mother, grandmother and friend who enjoyed spending time with her family and friends. 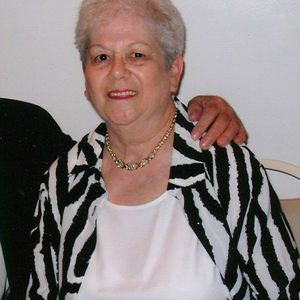 Lynn was an avid UCONN Huskies basketball and New York Yankees baseball fan, and she enjoyed going to Foxwood Casino. Besides her loving husband of 48 years, she leaves her beloved children, Laurie Zevallos and her husband Pablo and their children, Larissa, Alayna and Jason of Tolland, Keith Giard and his children, Jordan and Carly of South Windsor and their mother Barbara, and Kevin Giard and his wife Tina and their children Adam and Renae of Ellington; a sister, Joanne and Raymond Bustin of East Hartford; two brothers, Herbert and May Manley of Vernon and John and Marilyn Manley of New Britain, and many nieces and nephews. Her family would like to thank the staff at Rockville General Hospital, Intensive Care Unit, especially Kathleen Polhemus for all of the wonderful care that she received. Her family will receive friends for calling hours at the Ladd-Turkington & Carmon Funeral Home, 551 Talcottville Road (Route 83), Vernon on Tuesday, August 7, 2007 from 4 to 7 PM. Family and friends may gather at the funeral home on Wednesday, August 8, at 10 AM followed by a Mass of Christian Burial, 11 AM at St. Luke Church, 141 Maple Street, Ellington. Burial will follow in Ellington Center Cemetery.